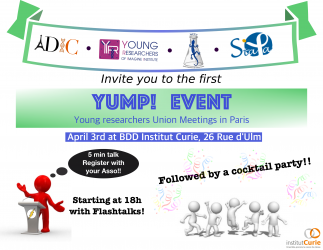 The associations of young researchers from Institut Curie (ADIC), Institut Imagine (YR2I), Institut Cochin (JeCCo) and Institut Pasteur (StaPa) are pleased to present you our new collaboration: Young researchers Union Meetings in Paris - YUMP! Flashtalks: 5 minutes per perticipants who are motivated to do it (one slide only). We strongly encourage to present. Cocktail to get to know each other and create a bigger and stronger network among us! If you are interested don’t hesitate to register by sending an email to Borja Rodriguez de Francisco and let us know if you want to give a flashtalk. 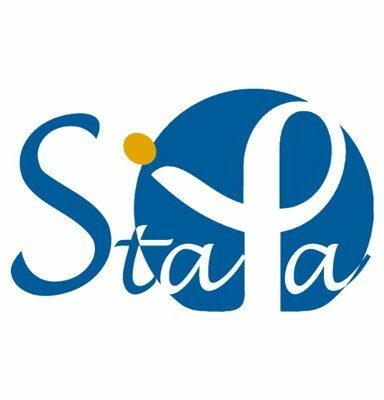 Please note that we have only 15 places for each association. The priority will be given to the brave ones who will go for the flashtalk.